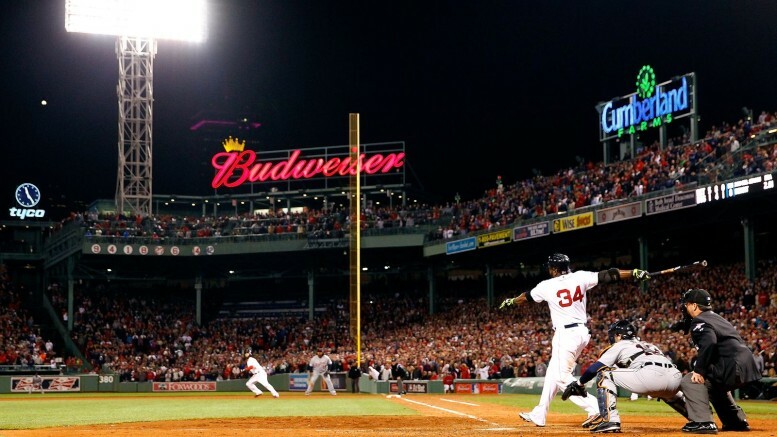 There was no way the Red Sox were turning back after this heroic grand slam by David Ortiz in Game 2 of the 2013 ALCS. You know the old terminology, but you may choose not to buy into if you’re not a believer in “destiny,” or at least destiny in the sports world. But doesn’t it just seem like many championship teams have moments when you just can’t help but utter, “maybe it’s just their year.” I know I have, and some are moments that will forever be etched in that sport’s lore. Here now are five teams this decade with moments when, frankly, you just knew it was their year. Destiny Calls: This was truly one of the more divine comebacks — or meltdowns, depending on your perspective — in recent memory. If you thought the Angels’ 8th-inning rally in Game 6 of the 2002 Fall Classic against the Giants was impressive, the Cardinals were thrice — not twice, but thrice — down to their last strike, in both the ninth and 10th innings, each time tying the game when the Rangers could have clinched the franchise’s first title. David Freese’s two-run triple knotted the score at 7-7 in the ninth, and after Josh Hamilton’s two-run shot gave Texas a 9-7 lead in the top of the 10th, Lance Berkman re-tied it with a single. Freese capped his historic night with a walk-off blast in the 11th, and for a team that had literally been playing elimination games on a nightly basis since they trailed by 10.5 games in the wild card standings in late August, this was the final hurdle. You could have bet your house and your first-born on the Redbirds in Game 7, and indeed they cruised to a 6-2 win. Destiny Calls: You could certainly make a case for “Hey Diddle Diddle, Ray Rice Up The Middle,” the heroic 4th-and-29 conversion he had in San Diego that led to an OT win, but nothing tops Jones’ 70-yard bomb from Joe Flacco in the closing seconds in Denver with the Ravens trailing 35-28. Rahim Moore was the goat, letting Jones get behind him, but Peyton Manning didn’t help matters by throwing a second INT of the game late in the first overtime. Justin Tucker’s 47-yard field goal capped the thrilling, 38-35 win, and left little doubt that this year’s Ravens would not suffer another heartbreaking loss in Foxborough. The Ravens dominated the Patriots in the second half and held off the 49ers in the Super Bowl, culminating Ray Lewis’ last ride. Jacoby Jones hauls in the “Mile High Miracle” in the 2012 divisional playoffs. Destiny Calls: Once “Boston Strong” became the Red Sox’s calling card, you had a feeling this might be another banner year at the Fens. A year of comebacks and walk-offs galore resulted in a 97-65 season, and Boston easily dispatched of Tampa Bay in the Division Series. But the Tigers’ vaunted pitching staff froze the Sox out in Game 1 of the ALCS with a near-no-hitter, and took a 5-0 lead after 5 1/2 innings in Game 2 and led 5-1 entering the bottom of the 8th. Al Albuquerque struck out Shane Victorino with two men on for the second out, but Dustin Pedroia singled to load the bases for David Ortiz. Jim Leyland went to his closer, Joaquin Benoit, but it only took one pitch for Benoit to squander the four-run lead. Ortiz ripped a ball to right then went just over the outstretched arm of his flying ex-teammate, Torii Hunter, tying the game at 5-5 as Hunter was bloodied on the fall into the Boston bullpen. That might as well have been a walk-off, but since it wasn’t, Jarrod Saltalamacchia singled home Jonny Gomes one frame later to tie the series at a game apiece. There was no way Boston was losing after that, but it was another grand slam that was the exclamation point, as Victorino put the Sox on top to stay in Game 6 with a seventh-inning salami. The Red Sox had a little drama in the World Series, but you never felt they were going to be denied by the Cardinals. They weren’t, winning in six games. Destiny Calls: One of my favorite Chris Berman-isms is “one is an accident, two is a trend, three is evidence.” For these Kings, the question was, which came first, the Shark or the Duck? Well, beating the former may have felt like an accident, but beating the latter was a trend. Once the Kings turned the Game 7 hat trick by beating the Blackhawks, it was plenty evident they would be Stanley Cup champions for a second time in three seasons. The Kings pulled off perhaps the toughest feat in sports by rallying from a 3-0 deficit to beat San Jose in the first round, but many felt that was just as much of a typical choke by the Sharks in the playoffs than a feat of strength by the Kings. But in the conference semis against cross-town rival Anaheim, the Kings continued to defy logic and prove that they had the magic touch just as they did in 2012. They won Games 1 and 2 in Anaheim before losing Games 3 and 4 at home and then Game 5 back in Anaheim. But after forcing a deciding game with a 2-1 victory in Game 6, the Kings came out guns blazing in Game 7 on the road, clinching the series with a 6-2 win. They made history by winning Game 7 in Chicago in overtime in the conference finals before breezing past the Rangers in five games in the Stanley Cup finals. Destiny Calls: Sure, this one is going to sound like a stretch, but I’m an alleged “conspiracy theorist,” so this should at least stay consistent with that proclamation. But after “we’re on to Cincinnati” and a typical wave of high-scoring games by New England, the season still didn’t seem to distinguish itself from the previous four when New England won 12 or more games and secured a first-round bye each time. So leave it to a bizarre set of circumstances to give this 2014 team a destiny feel. That would be November 23, 2014, 14 years to the day that Tom Brady played in his first NFL game, in mop-up duty of a 34-9 loss to — you guessed it — the Lions on Thanksgiving Day 2000. The Patriots led 27-9 with two minutes to go against a 2014 Detroit team that had yet to allow 30 points in a game. Think Bill Belichick didn’t know that? He kicked a field goal that would have made it 30-9, but the Lions were offsides, so Belichick took the points off the board and with two minutes to play and the Lions out of timeouts, he could have taken three kneel-downs to end it. But this is Bill Belichick, so he ran LeGarrette Blount — playing his first game back with New England after walking out on the Steelers, literally — and Blount scored to make it 34-9. Think Belichick didn’t know that, either? The running-up-the-score agitated the volatile Dominic Raiola, but it cemented a 34-9 win 14 years to the day that Tom Brady officially broke into the NFL. This Patriots team had destiny and a defense, and their fourth Lombardi Trophy was more inevitable this day than even their historic, two 14-point comebacks against Baltimore in the divisional playoffs. Be the first to comment on "“It Was Just Their Year”"